One of the most valued traditions in our movement is peaceful protest. On Saturday our union marched through the streets of London to call for change. We did not face physical attack nor did we fear it. We certainly didn’t have to fear the use of live ammunition, snipers or soldiers firing indiscriminately into the crowd. Yet only two days later, such slaughter was wreaked upon another peaceful protest in Gaza. UNISON condemns the brutal massacre of 58 Palestinian protestors and injury to over 2,700 more, near Gaza’s border with Israel. Since the end of March approximately 100 protestors have been killed by the Israeli army and more than 12,000 injured. At times of such horror and slaughter, the purpose of peaceful demonstration can often be lost. Yet it is vital we combine anger at these senseless killings with our support for the cause that brought the protesters out in the first place. For the last 11 years Gaza has been devastated by a tight land, sea and air blockade, which has turned this narrow strip of land into a virtual prison for two million women, children and men. The blockade has denied the population access to adequate healthcare, shelter, water and electricity, and resulted in one of the highest levels of unemployment in the world. The images of brave ambulance workers, risking their lives to rescue protesters injured by Israeli gunfire have highlighted the impact of the blockade on a health service still recovering from the impact of Israel ‘s last major attack in 2014. Hospitals are at breaking point as they struggle to cope with the vast number of seriously injured protesters. Essential drugs and dressings remain in short supply and hospitals and water treatment facilities report only having enough fuel for the next few days. The response of the UK government has been appalling. 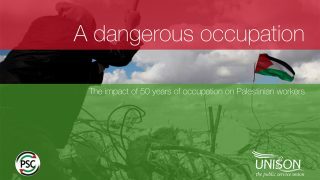 Its attempt to apportion equal blame to both the Palestinian protesters and the Israeli soldiers who gunned them down, fails to recognise the disproportionate use of force by the Israeli military, the terrible conditions endured by the population of Gaza, or the illegality of the blockade. 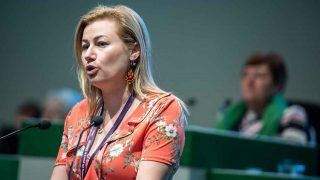 UNISON urges ministers to demand an end to the blockade of Gaza and the occupation of Palestine, call for an independent UN-led investigation into the killings, suspend the arms trade with Israel, and support essential public services, including healthcare, water and electricity for the people of Gaza. Many UNISON branches throughout the country will want to offer their solidarity to the people of Gaza. 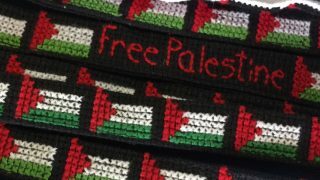 We encourage branches to make a donation to Medical Aid for Palestinians, which is providing essential medical supplies and care to the victims of the violence. As public sector workers, as internationalists and as people the scenes of ambulance workers treating those gunned down will stay with us. We condemn the government of Israel for its actions that have brought fresh pain to the Palestinian people and we pledge to redouble our efforts to campaign for the rights of Palestinians, peace and a time when such aggression, violence and killing can be consigned to the history books.